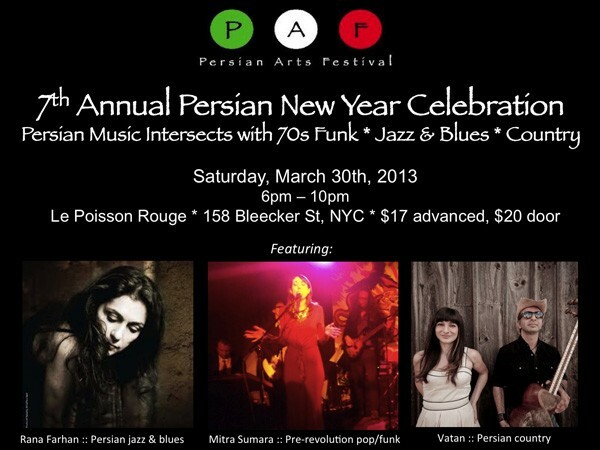 NYC’s Persian Arts Festival, Inc. (PAF), an organization devoted to providing a platform for Persian artists and visionaries, joins forces with Le Poisson Rouge and other Persian cultural organizations to present a New Year extravaganza featuring Persian fusion from three of the city’s top-tiered bands. The evening will be full of musical surprise and delight, featuring rare Persian grooves by DJ Payam, Rana Farhan’s unique blend of classic Persian poetry with contemporary jazz and blues, Vatan’s Persian-meets-country-rock sounds and a blast into the past with Mitra Sumara’s super group of New York City musicians that pay homage to the vibrant pop and funk music of 60s/70s Iran. 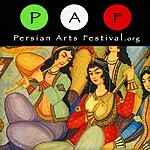 This year’s event is sponsored by the American Institute of Iranian Studies (AIIrS – www.simorgh-aiis.org), Public Affairs Alliance of Iranian Americans (PAAIA – www.paaia.org) and Iranian Alliances Across Borders (IAAB – http://www.iranianalliances.org/).